Would make for a perfect commuter rail stop along a line to Athens, via Tucker and Lawrenceville. Located in Tucker, a few miles from Stone Mountain, the development could include nearly 200,000 square feet of retail, 88,000 square feet of office space, an elementary school and daycare, and a mix of residential units appealing to everyone from millennials to seniors, officials say. Also included in the proposal are a 36,000-square-foot grocery store, a brew pub, and even a food hall in the vein of Ponce City Market. This has been a derelict property since I was a kid. Good for Tucker if they can get something going on this massive waste of space. Hopefully, retiming the lights on Hugh Howell and Mountain Industrial are part of the project. Intersection is already gridlocked. I find it somewhat humorous that the apartments are labelled "Millennial Rental Units." Do only Millennials rent? 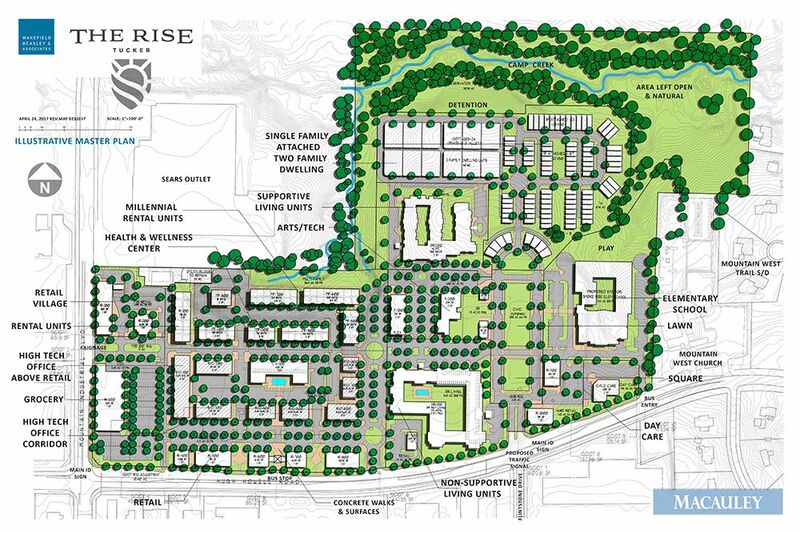 The City of Tucker sees this development as key to linking two sides of town, City of Tucker and Smoke Rise, divided by a half-mile wide swath of industrial-zoned land along Mountain Industrial Blvd. Looks like everybody is jumping on the mixed use bandwagon. Isn't that how our cities use to be built pre-WW2 and the rise of auto suburbs? A better way to think about it, I think, is to consider this a reversion to cities have been built for milinia before.